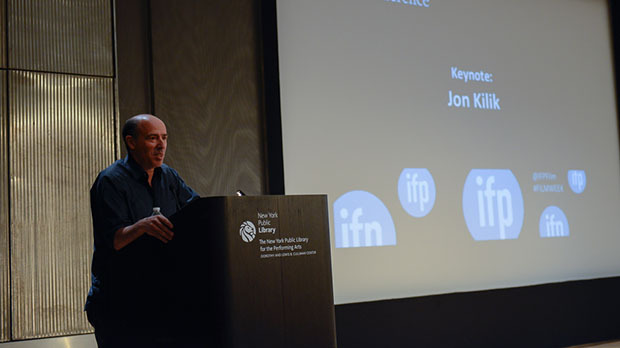 The following is the keynote speech delivered by Jon Kilik at the IFP’s Filmmaker Conference in New York City earlier this week. Good afternoon. Welcome. I’d like to thank Joana, Amy, Rose, and everyone at the IFP for having me here. And to all of you, for sharing your day and your time with me. The value of that time, with so many things that you could choose to do on this Sunday afternoon, is part of this discussion. Thank you for choosing to be here. In a recent talk at USC, George Lucas and Steven Spielberg predicted that the film industry is on track to have a “massive implosion” because there just isn’t enough time in the day for people to support all the films released in theaters. Lucas complained that it’s getting so bad it is even hard for him to get a film in a theater and that this should make producers of films very nervous. According to these great titans, CINEMA is in danger of disappearing from the theaters and MOVIES are to be relegated to a lurid sensational experience akin to a theme park ride or Las Vegas Dinner Theater. Many people have predicted the end of the film business. Or at least a cataclysmic shake up that destroys all modestly budgeted films of quality leaving us with only 4D motion control Blockbusters. These End-of-Days predictions have come before in our industry. The advent of Color was supposed to eventually doom Black and White — in which case we would have never had Dr. Strangelove, Manhattan, Raging Bull, or Schindler’s List. Or She’s Gotta Have It, Stranger Than Paradise, or Pi – giving birth to Spike Lee, Jim Jarmusch and Darren Aronofsky. Television was supposed to doom the theatrical experience – why would anyone want to go out to a movie when they can get it at home. Cable TV and DVD’s were supposed to do the same thing. Video on Demand and companies like Netflix were supposed to do it again. It hasn’t happened – what has happened is that we now have more ways to make movies and more ways to get people to see them than ever before. So my advice to us, all of us, from film students to Spielberg, Lucas and Soderbergh, all of us who make human movies that we care about, my advice is to ignore the prophecies, DON’T RETIRE, and keep on making films and showing films by any means available. Build and they will come. The Internet has allowed us to express individuality and form communities that were unimaginable before. Social Media finds like-minded individuals and bonds them together in the formation of these communities. That’s another word for an audience. And in this way, there may be more opportunity for independent film than there ever has been in it’s history. All of this sets the stage for a renaissance in Independent Filmmaking. Instead of being on its last legs I would argue that the Independent Film is about to spring to life. So why the doom and gloom about the film industry? Yes it’s true that movies have become a crass commercial commodity at times and studios have crowded these spectacles into theaters at a disproportional rate. But it’s also true that sensitive, brave, personal, and courageous work is being done everyday. For every tent pole being built pixel by pixel in a Hollywood Laboratory, there is a young filmmaker like Benh Zeitlin going into the bathtub of New Orleans with a small cast and crew and a 16MM camera to create a uniquely personal vision. Beasts of the Southern Wild found its way all the way to the White House and to the Oscars. For every sequel that’s being churned out, there is something new and original fighting to be born. It’s never been harder and it’s never been easier. I guess it’s been like that all along. I’ve been lucky to work with a great number of talented directors. All of them have made the film for themselves first, and the audience second. That’s not out of vanity, or because they don’t care about the people who see their films. It’s because they know the only way to truly connect to an audience is to be as personal as they possibly can and share that piece of themselves onscreen. I’ve made five films with my friend Julian Schnabel. None were financed by studios, none were financed by indies, they were made with the help of private contributors who believed in us when no company did. For us, raising money through social media meant making phone calls, shaking hands, and writing letters. I can’t really blame any executive for not buying based on our pitch. Basquiat — Black graffiti artist living on the streets of New York City in the late 70’s, rises to fame in the early 80’s, but drugs and depression result in death at age 27. Before Night Falls — Gay Cuban novelist Reinaldo Arenas finally escapes Castro’s Cuba but contracts AIDS and dies in New York City by assisted suicide. We’re going to do it in English but mix Spanish when we feel like it or if an actor can’t speak English. The Diving Bell and the Butterfly — Jean Dominique Bauby is the editor of French Elle and on top of the world when he suffers a massive stroke. He wakes up 20 days later completely paralyzed. Unable to communicate he can only blink his left eyelid. Despite his condition, he writes a book by blinking when the correct letter was reached by his nurse slowly reciting the alphabet one letter at a time. And we are going to do it in French. Miral — The story of a young Palestinian girl who, after her mother’s suicide, is sent to an orphanage in Jerusalem. She is assigned to teach at a refugee camp on the West Bank where she falls in love with a Palestinian militant. She is later arrested, interrogated, and tortured by Israeli soldiers. We got them all made and eventually they all found theatrical distribution. Basquiat won an Independent Spirit Award. Before Night Falls and The Diving Bell received Oscar nominations. Even Miral, despite poor reviews, was honored by the Muslim Public Affairs Council and screened at the United Nations General Assembly. You can find your audience. So who out there wants to hear about our next one? It’s loosely based on Dante’s Inferno. All financiers can start to form a line outside now. I’m a film producer but I know NOT to value a movie based on budget. Story is what is important. In whatever form you choose to tell yours, you have the opportunity to challenge the status quo, provoke thought, shine a light on an event, a condition, a time and a place, give a voice to those who have none, or simply make a love story, a comedy or a genre film. Tell your story. The work will outlive the format. Now the record business really has imploded due to new technology. But despite this, there are more musicians creating more types of music than ever before. In film, if you don’t have a vision for something it doesn’t happen. You’ve got to believe it to see it. Eventually you will find your audience or more accurately they will find you. Film has a 100-year history of adapting to the changes and challenges brought on by new technology. This will always get figured out. The ease of being able to reach people will only increase. So it isn’t true that cinema is dead, it’s actually a very healthy industry and as Soderbergh pointed out, it’s one of the few American exports that continues to do very well. But we can’t ignore that one particular sector of the market is getting squeezed and must be protected – the midrange budget drama – movies about HUMAN BEINGS. But despite that squeeze, many talented filmmakers, young and old, have overcome the challenge and made a large quantity of quality independent dramas that are coming out this year. I have never seen so many high quality films entering the main stream. Blue Jasmine, Fruitvale Station, Mud, The Butler, Inside Llewyn Davis, Gravity, Her, 12 Years a Slave, Nebraska, American Hustle, Foxcatcher, Out of the Furnace, Captain Phillips, Rush, The Monuments Men, Prisoners, August Osage County, Philomena, Mandela: Long Walk to Freedom, Saving Mr. Banks, Labor Day, All is Lost. I’m sure there are several more I’m missing. Has there ever been a better time for Independent Cinema? I can’t wait to see all of them. I’m predicting a great year. Thank you to all the distributors who bring these films to the theaters. All distributors both independent and major studios for continuing to finance and distribute movies about the human condition. For supporting handmade films by auteur filmmakers. Stay strong, stay committed, and we will continue to partner with you to grow the great history of American Independent Cinema. Studio executives are not our enemy. Especially today with more women and growing diversity. I have found execs – to a person – as hardworking and courageous as their filmmaker counterparts. They are passionate and educated in film history and often put their job on the line to help a filmmaker get what he or she needs. And finally, I want to leave you with a quote from one of the most inspiring speeches I have ever heard. It was at the 73rd Academy Awards. I was fortunate to be there with two independent films: Before Night Falls and our Best Actor nominee Javier Bardem, and Pollock with our Best Actor nominee Ed Harris and Best Supporting Actress winner Marcia Gay Harden. The speech came in a different category but it struck deep and I never forgot it. It went like this –”I want to thank anyone who spends part of their day creating. I don’t care if it’s a book, a film, a painting, a dance, a piece of theater, a piece of music, anybody who spends part of their day sharing their experience with us. I think this world would be unlivable without art and I thank you.” That was from Steven Soderbergh, Academy Award Winner, Best Director, March 25th, 2001.